Wow, Chanukah has already passed and Christmas is just days away! I haven’t had a chance to bake much this season because of all my art projects, but managed to combine my two loves for this batch of Pistachio Cranberry Biscotti. I’ve been making these biscotti pretty much every year, but this time I changed it up by adding orange zest and a 1 tablespoon of orange juice to the batter. I thought they’d be pretty with some white, so I drizzled melted white chocolate over the biscotti. It is featured on their site this week as a Red and Green recipe. 1. Preheat oven to 325 F. Line baking sheet with parchment. 2 Whisk together flour, sugar, baking soda &powder &salt in a large bowl. Add eggs, vanilla, orange zest and beat with mixer just until a dough forms. 3. Add cranberries and pistachios and mix at low speed. 4. Turn out dough onto a well-floured surface and knead several times. Halve dough, then form each half into a 13 by 2 inch slightly flattened log on baking sheet, Brush logs with egg wash.
5. Bake in middle of oven until golden, 25 to 30 minutes. Cool logs on baking sheet on a rack 10 minutes. 6. Transfer to a cutting board and cut diagonally into 1/2 inch thick slices with a serrated knife. Arrange slices, cut side down, in 1 layer on baking sheet Bake in middle of oven turning once until golden and crisp. 20 – 25 minutes total. 7. Cool completely and drizzle with melted white chocolate if you’d like. Put the melted chocolate in a sandwich bag, seal, and snip a hole in one corner. Squeeze and drizzle chocolate over cooled biscotti. Chill in the refrigerator to set chocolate. I wish I could be an organized person. You the know the type: Someone who has a closet that looks like this. Someone who never makes scheduling mistakes. Someone who can juggle the seven different ongoing projects life hands her. I have so many photos of dishes to post, half written recipes here and there. To be honest, sometimes I forget about them. Or worse, they pile up on the computer, mocking me, and I begin to have stress dreams about forgetting to turn in all the assignments during the semester and I have to get everything in to pass the class! Not the most photogenic dish, but very delicious! 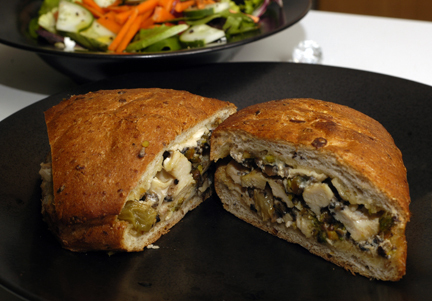 The truth is, I entered this recipe in a contest for olives awhile ago. I heard the winning recipe was an olive couscous, but I can’t find it anywhere! The goat cheese stuffing in my recipe is good by itself as a dip– it would be easy to use as part of an appetizer too. It’s creamy, lemony, and salty and briny from the olives. 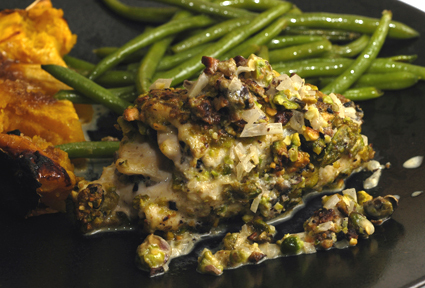 I thought pistachios would work well with the flavors, so I coated the chicken with it. The cream sauce pulls it together. It’s also good as a leftover — in a sandwich! (Recipe at end of post). 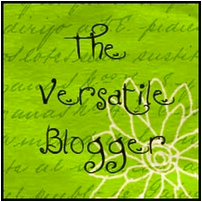 Another post that is long overdue is acknowledging that I received the Versatile Blogger Award from Jereme@jeremeskitchen.com, Sharyn@thekalechronicals.com, and most recently Choc Chip Uru@gobakeyourself.wordpress.com. The great part of receiving the award is that I get to introduce readers to fifteen other blogs that I’ve just discovered and share the love. Yelena@Cooking Melangery – amazing recipes here and such beautiful photography! Amy@Fragrant Vanilla Cake – wonderful, mouth watering vegan desserts and mixed drinks featured here. TheMomChef@Taking On Magazines One Recipe At A Time – I love that she reviews a lot of Cooking Light recipes and honestly says what works and what doesn’t, and what she would do differently next time. Kiri@Healthy Foodie Travels – check out her great recipe from all different cuisines! Gourmande In Osaka – beautiful Japanese and French dishes that always make me want to experiment in the kitchen. Lindsay Ann@Doll House Bake Shoppe – just found this site, and I’m obsessed with it. I love all things miniature. Jenn@Just Jenn Recipes – AMAZING Star Wars and Lego inspired treats. She throws the best kid parties. Tobias@T and Tea Cake – I love his recipes -often translated by him from German. TheMagicofSpice@The Ardent Epicure – if you want a doable recipe to impress your foodie friends, look no further! Jay@Local Food Me – a fellow New Yorker who features recipes made from seasonal, local, and affordable ingredients. Julie@Mommie Cooks! – check out her family friendly recipes! Thanks for all the great posts and inspiration! 1. Preheat oven to 350 degrees. Brush a 9×13 inch baking dish with olive oil. Mix olives into goat cheese until well incorporated. Add in zest and golden raisins. Set aside. Cut chicken breasts in half lengthwise and pound to an even ¼-inch thickness. Season with salt and pepper. Spread goat cheese mixture on each breast piece. Roll up and secure with a toothpick. 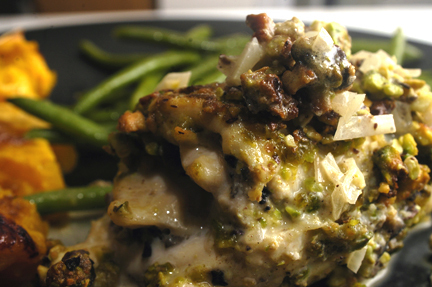 Dredge each roll in egg and coat with pistachio nuts. Set aside. Reserve any leftover pistachio bits. Heat 1 tablespoon oil in skillet over medium heat. In batches, lightly brown each chicken breast roll on all sides until pistachios are golden. Do not crowd pan. Add oil as needed. Remove pan from heat and transfer chicken to prepared baking dish. Bake chicken in oven for 25-30 minutes or until chicken is cooked through. Remove cooked pistachio bits to a dish and reserve. Do not wash skillet. While chicken is baking, make cream sauce. Heat 1 tablespoon oil in used skillet. Saute shallot in oil until softened. Add reserved pistachio bits from dredging. Saute until golden. Then add reserved cooked pistachio bits. Add chicken broth, bring to a boil and cook, stirring until sauce is reduced by half. Add cream. Add salt and pepper to taste. Simmer for 2 minutes. Add butter, stir to incorporate and remove from heat. When chicken is done, remove toothpicks and serve with sauce.